Not only are you close to the slopes, all the fun shops and dining of this winter wonderland are just steps away! Whether you spent the day skiing, hiking, or just hanging out - recoup with a dip in the hot tub. Work on your backstroke or just splash around with the kiddos at the indoor pool. Swing by the sauna to thaw out and relax after a fun-filled snow day. No need to rush through breakfast, Blackcomb Excalibur Gondola is just a 5 minute walk. Smack in the middle of Whistler Village, you're close to dining, shopping, and the all-important grocery store. The indoor hot tub will get you nice a toasty, no matter how cold it is outside. Drive 6 minutes to the Blackcomb Trailhead to get in touch with nature. Don't forget your clubs! Whistler Golf Course is only a 4 minute walk away. When looking for lodgings for an epic ski trip, it’s all about real estate! Nestled in the heart of the quaint yet exciting Whistler Village, at the Blackcomb Lodge European charm meets West Coast style in spacious, well-appointed suites that feel like home rather than hotel - with the best ski area on the continent for your backyard! For years SKI Magazine has declared Whistler Blackcomb the #1 destination in North America, so your crew will be stoked to be staying right at the base. After a tasty breakfast cooked in your en-suite kitchen (and maybe some pre-ski stretches) just grab your gear and waltz on outside - you’ll be in line for the lifts in minutes flat. Explore 8,000 acres across two different mountains on some of the most prime powder in the world. Hop on the revolutionary interconnecting Peak 2 Peak Gondola to ride the the best of both mountains and enjoy 360 views of Whistler. If there’s youngsters in your crew in need of a refresher, the top-notch Snow School has both classic lessons and engaging programs. Adventure Camp provides kiddos with small class sizes and fun activities, while the Ride Tribe lets teens try some park, pipe and big mountain riding. As the sun begins to set and the snow starts to slick, coast right up to the Blackcomb Lodge and rendezvous with the crew at the suite. See who’s up for a trip to the indoor hot tubs (a unanimous “Me!”) and swap your ski jackets for swimsuits. Soak away any wipeout-related kinks in the hot tub while the kids play Marco Polo in Whistler’s only indoor pool. Follow up with a stop by the cedar wood sauna for some serious R ‘n R.
Well appointed and tastefully decorated, homey condo suites provide families and friend groups with a relaxed alpine ambience. Fully equipped kitchenette (and walkable supermarkets) gives you the option of cooking up whatever comfort food you’re craving. A spacious living area with cushy couch and flat screen TV is prime for a low-key night in - pop some popcorn, put on a pay per view flick, and settle in for movie night with the crew. Couples and smaller crews will love the Studio unit, with a comfy King and Queen sleeper sofa. For families and groups of up to six, the Studio Loft adds a pair of upstairs twins. Plus, the loft gives kiddos their own space (and the perfect spot for building blanket forts). When staying in the heart of a ski village, an endless variety of shops, dining and nightlife are just outside your door. Choose from an array of ski-in spots for aprés drinks and a hearty meal. Plus, there’s plenty of fun to be had off the slopes in this winter wonderland. Go ice skating at Olympic Plaza, explore Native American trails via snowshoeing, or book a dog-sledding excursion for a uniquely-Canadian adventure. Whistler Blackcomb is also home to 160 kilometers (aka a hundred miles for you Yanks) of scenic cross country skiing trails. Located at the base of Whistler Mountain, within walking distance to Blackcomb Excalibur Gondola and Whistler Village Gondola. 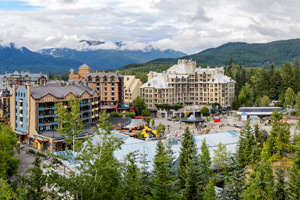 Whistler Village is pedestrian-only and features outlet shops, fine dining and an active night life. The area also offers a museum, art galleries, a library and spas.